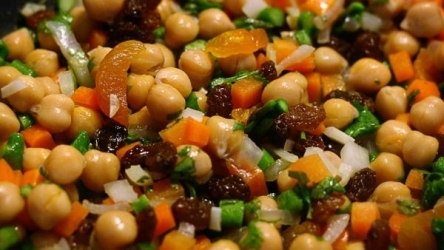 Garbanzo Beans and Raisins is a Moroccan food recipe with carrots and served over rice. Saute onions and garlic in saucepan, stirring frequently until tender, about 7 minutes. 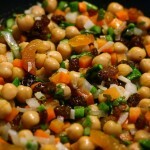 Add remaining ingredients except garbanzo beans and rice. Heat to boiling, reduce heat, cover and cook until squash is tender, about 8 minutes. Stir in garbanzo beans. Serve over rice.